Stork spread (or butter) and lard until it resembles fine breadcrumbs. Make a deep well in the flour and add the egg, yeast mixture and 250ml warm water. Draw the flour from the edge over the yeast mixture so that it is completely covered. Cover with a clean tea towel and put in a warm place until it erupts like a volcano and nearly doubles in size (about 45-55 minutes). 2. With lightly floured hands, incorporate the sultanas into the mixture, working it just a little until you have smooth dough; don’t knead vigorously as you would bread dough. Divide and shape the dough into 20 balls (weigh them into exact pieces; about 80g is a good size), then roll each one on a lightly floured surface to make a smooth bun. Place the buns in even rows on a large, oiled baking tray (or 2 smaller ones). Cover with a clean tea towel and put in a warm place to rise, until almost doubled in size again (about 25-30 minutes). 3. Preheat the oven to 200 ̊C, gas mark 6. 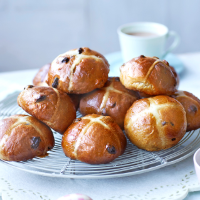 For the crosses, whisk the flour with 80ml water to make a smooth paste and spoon into a piping bag or sandwich bag. Snip a small slit in the end and pipe a line along each row of proved buns, then repeat in the other direction to create crosses. Bake for 35-40 minutes on the middle shelf of the oven, until a rich golden colour. 4. Meanwhile, make the sugar syrup glaze. In a saucepan, mix the sugar with 3 tbsp water and simmer over a low heat until syrupy and all the sugar has dissolved (about 2-3 minutes). Transfer the buns to a wire rack, brush over the sugar glaze and leave to cool before serving.